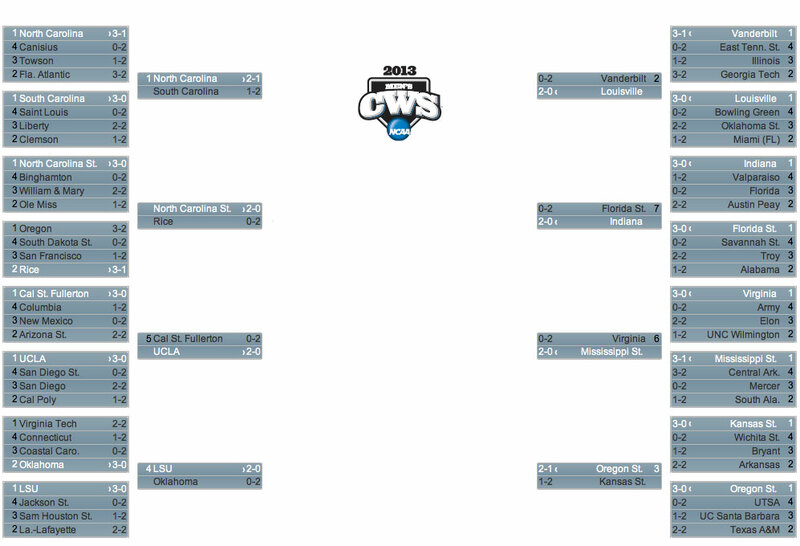 The NCAA Tournament once boasted a field of 64 determined college baseball teams, but following regional and super regional play, that field has become a competitive field of eight teams. Each of these eight teams have been amongst the top-ranked teams in the nation all season long and are now able to display their strength and determination in the College World Series in Omaha later this week. Omaha commences with a double elimination round, which will determine the two teams that will battle for the NCAA title. A best of three games championship series will ultimately determine the NCAA championship team. Below we have previewed each of the eight teams that will appear in this year’s College World Series, breaking down the basics of and the respective road to Omaha for each team. CWS Appearances: 1 (2013). Indiana is making their first trip to Omaha this year. Road to Omaha: Indiana has made it known that they are not just a football school, as they have cruised through both regionals and super regionals with relative ease. After sweeping the field in regionals, outscoring opponents 26-11, the Hoosiers continued onto the supers with a two-game sweep of Florida State. Although Indiana pitching surrendered 17 runs in two games, the hot-hitting offense feasted on a talented Seminoles pitching core, plating 21 runs in an impressive showing on the road before a difficult crowd in Tallahassee. In advancing to their first College World Series, the Hoosiers also became the first Big Ten team to make it to Omaha since 1984. Road to Omaha: With respectable victories over Bowling Green and Miami (FL), Louisville capped a regionals championship with a 12-3 rout of Oklahoma State to advance to super regionals. In order to advance to just their second College World Series in school history, the Cardinals needed to get past the number two ranked team in the nation at home in Nashville. That team would be Vanderbilt and they did not pose a problem for the Cardinals. Sweeping the Commodores in two games, Louisville bested one of the best 1-2 rotation punches in college, wherein Golden Spikes Award finalist Tyler Beede was outdueled by Big East Player of the Year Jeff Thompson in a 2-1 victory in game two that propelled the Cardinals to Omaha. CWS Appearances: 16 (1986. 1987, 1989, 1990, 1991, 1993, 1994, 1996, 1997, 1998, 2000, 2003, 2004, 2008, 2009, 2013). NCAA titles in bold. 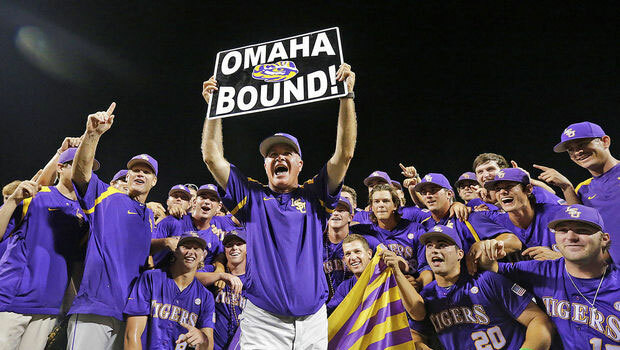 Road to Omaha: After a sweep of the competition in the Baton Rouge Regionals, the LSU Tigers hosted the Oklahoma Sooners in super regional play, where they would once again sweep their competition, this time advancing to the College World Series, their first appearance since winning the NCAA title in 2009. A rubber-match took place between 2013 third-overall pick Jonathan Gray and LSU’s ace Aaron Nola in game one, a 2-0 complete-game shutout for the LSU sophomore hurler. In two starts throughout regional and super regional play, Nola is 2-0 with a perfect 0.00 ERA in 16.0 innings of work. A stout 1-2 punch in Nola and Ryan Eades, along with a hot-hitting lineup led by Alex Bregman and Raph Rhymes, will help lead the Tigers towards their seventh NCAA title in school history. 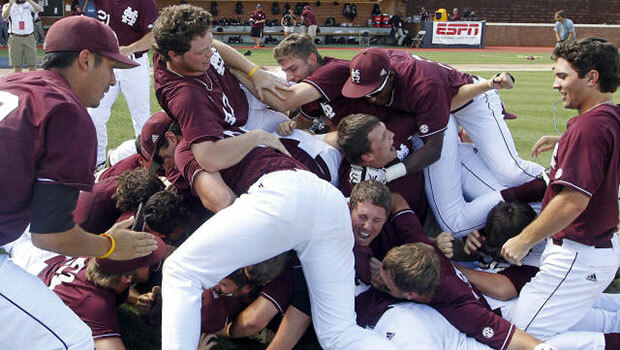 Road to Omaha: In winning the Starkville Regional Championship game against Central Arkansas, the Mississippi State Bulldogs rolled over the number six ranked Virginia Cavaliers in the Charlottesville Super Regional, raking a total of 30 hits in their two game sweep of the Cavaliers. Adam Frazier led the way for the Bulldogs in super regional play, registering eight hits and driving in five runs. One of the best bullpens in college baseball resides with Mississippi State, as four relievers have ERAs under 2.00, led by Jonathan Holder and Ross Mitchell who have been vital for the Bulldogs in the postseason. The Bulldogs have the momentum and are eager to bring their first NCAA title home to Starkville. Road to Omaha: North Carolina advanced to the super regionals after winning a 13 inning marathon against Florida Atlantic 3-2 in regional play where they would take on South Carolina. The North Carolina Tar Heels secured the final berth in the 2013 College World Series with a 5-4 win over the South Carolina Gamecocks. North Carolina won Saturday’s season opener 6-5, but South Carolina rebounded on Sunday in an elimination game to beat the Tar Heels 8-0. CWS Appearances: 2 (1968, 2013). NC State will be in Omaha for the first time in 45 years. Road to Omaha: NC State breezed through regional play behind the dominant complete-game shutout by staff ace Carlos Rodon in game two against William & Mary. In advancing to super regionals against Rice, the Wolfpack would win a pair of close contests, including a 17-inning marathon that cemented their first trip to Omaha since 1968. NC State was led by the offensive production of both Trea Turner and Tarran Senay. Throughout both regional and super regional play, Turner batted .391 with eight hits and Senay batted .364 while slugging two home runs and driving in nine runs. CWS Appearances: 5 (1952, 2005, 2006, 2007, 2013). NCAA titles in bold. Road to Omaha: Beavers starter Ben Wetzler turned in a complete-game gem in which he struck out 10 batters in the Corvallis Regional Championship game against Texas A&M, sending the Beavers to the super regionals to take on Kansas State. Despite a 6-2 loss in game one, the Beavers would rebound to oust Kansas State from the NCAA tournament, outscoring the Wildcats 16-7 in the final two games of the series. A formidable starting rotation led by Matt Body, Ben Wetzler, and Andrew Moore, as well as a strong offense anchored by the big bat of Michael Conforto, make Oregon State one of the most dangerous teams in the College World Series, as they will attempt to take home their third NCAA title. 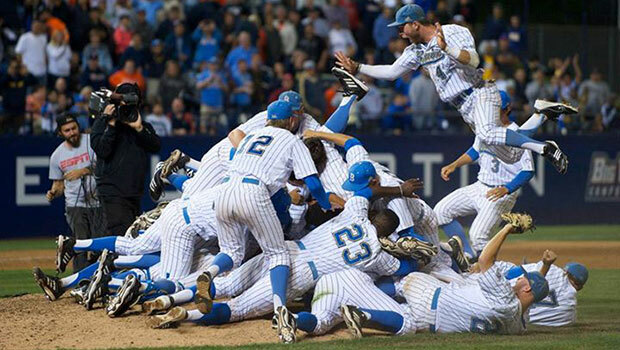 Road to Omaha: UCLA advanced to the super regionals on a 6-0 shutout of the Kris Bryant-led San Diego Toreros in the Los Angeles Regional Championship game. Bruins closer David Berg would lead UCLA out of an extra innings contest against Cal State Fullerton, a 5-3 game one victory for the Bruins. The Bruins would oust the Titans with ease by a score of 3-0 to advance to their second straight College World Series. UCLA staff ace Adam Plutko was previously 5-0 with a 0.97 ERA in five postseason starts in his career with the Bruins, as a seven-inning gem in game one was relegated to a no-decision. Look for Plutko to lead the Bruins in their quest for the first NCAA title in school history.